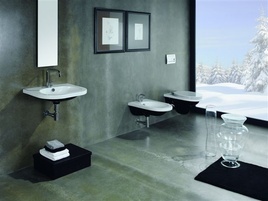 Further to our recent notification regarding the Healey & Lord range of sanitary ware, I am pleased to announce that we have teamed up with European manufacturer Valadares and we are now stocking their latest luxury bathroom suites. These exciting new products are now available for purchase and for the first time we are able to deliver suites to you one at a time. We will of course be giving healthy discounts for those of you wanting to take product into stock and will be offering competitive display terms. Our accompanying literature is under development and will be reflecting both the exceptionally high standard to which these products have been made and our own interesting new take on sanitary ware……..
We would welcome the opportunity to come and see you with samples, so if you are interested in having a look or if you would like any further information at all, please do not hesitate to contact us; I hope to hear from you in the near future.